Huggable, cozy and warm, loved by adults and children alike. Designed by Ildiko Pataki. Unique Embroidery Design by Vodmochka Graffix. 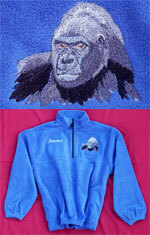 The polyester threads used for the embroidery are highly resistant to fading.